I was asked if I could make some basic North American Indian clothes so here they are if anyone is interested. 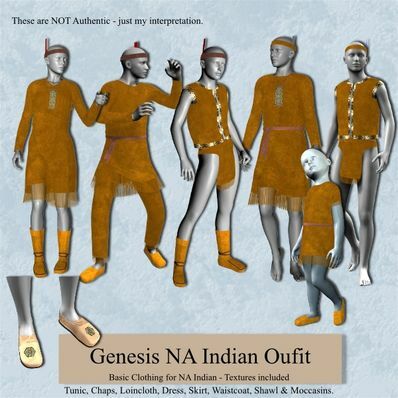 A NA Indian Outfit for Genesis for use in Daz Studio 4. These designs are NOT authentic, they are my interpretation. Will work with most poses and shapes. It's called Sorting out a Few Problems and is in Help & Tutorials. There is also a text file in the downloaded zip that also tells you what to do about Duplicate IDs. Where is this tutorial? I am not seeing it on the page. There is a tutorial on what to do with Duplicate IDs. This will tell you what to do. The clothing will load white - material files are in a seperate folder called Materials. I am having a little problem with this file. I take it and extract to my library, but then when I go to open it in Daz it gives the "Duplicate ID's" warning and when it loads it is white. Help? Love it, the kids can play cowboys and Indians. Thank you.